Tsunami debris track: NASA Earth Observatory image by Jesse Allen, using model data courtesy of Jan Hafner, International Pacific Research Center. Orange and red shaded areas represent parcels of water with a high probably of containing floating debris. The deeper the red color, the higher the likely concentration. The debris field stretches roughly 5,000 kilometers by 2,000 kilometers [3,100 by 1,242 miles] across the North Pacific. 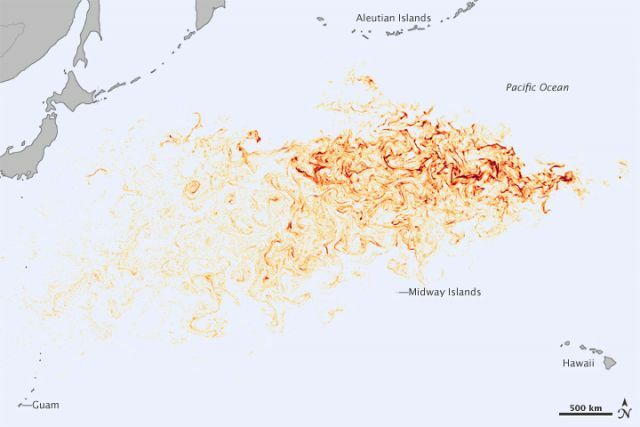 The model begins with more than 678,000 “tracers” being released from various points along the northeastern coast of Japan on March 11, 2011…The still image above shows the predicted distribution of debris by April 3, 2012. Debris was initially carried by the powerful Kuroshio Current towards the North Pacific Current. Some should reach western North America within a year or two, while much is likely destined for eternal capture in the North Pacific Gyre’s garbage patch.